Someone sent me a link to a video about Team Hoyt. This was a long, long time ago. As I watched this father push his son, I was floored. I was inspired. It gave new meaning to “strong enough.” At the time I didn’t think that it had much to do with me, but I never forgot those images. I never forgot the love. Last year when I registered for both half-marathons, I admit, I checked the rules. I looked to see if a stroller or a wheelchair would be allowed. The rules clearly stated that wheelchairs and strollers were NOT allowed. Did I secretly give a sigh of relief? Maybe. I’ll never tell. This year I checked the rules again as I registered for the Salt Lake City Half-Marathon. Nothing had changed. In fact it stated “No wheelchairs. No strollers. No exceptions.” I was checking the rules for myself… sort of, I mean Lucy hadn’t even asked about it. I just wondered how it was that Team Hoyt seemed to find so many races that would allow them to participate when so far I was ZERO for Three. I was in the kitchen. Lucy was on the sofa reading. She looked up and said, “I really want to run a half-marathon.” My heart sank just a little because… I had already looked. I already knew the answer was “no.” I smiled at my daughter and said, “That would be fun wouldn’t it?” But, I could still see the words “No Exceptions” clearly in my mind. Weeks went by and no one called me back, so I posted “Run With Your Life” and I only talked about Leah joining us in the race which was exciting and amazing and… I knew something was missing. You knew it too. You asked about Lucy in your comments. Then… two days later I got word. THEY WOULD MAKE AN EXCEPTION! I might have jumped up and down in my front yard and whooped and hollered a bit. I just might have. I couldn’t wait to tell Lucy. As soon as she was off the school bus and the bus engine had faded enough for us to talk I told her, “Lucy, I have really exciting news! You can do the half-marathon with us! We can all run as a family!” Lucy’s eyes were wide with disbelief. She put out her arms to hug me. Her eyes welled with tears. “Can you believe it Lucy?” I asked. We hadn’t been training with her and now the race was only a month away. 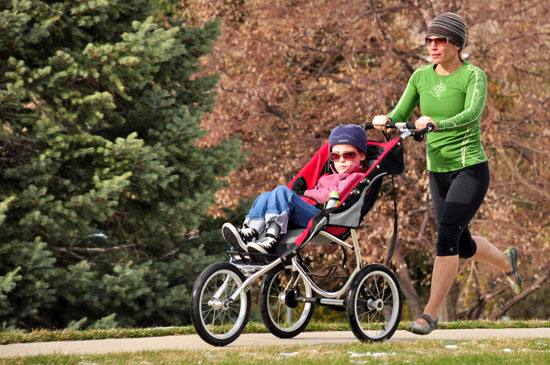 We didn’t even own a jog-stroller. I called my friend Mike at Baby Bling Design Co. I knew that even though he doesn’t make the kind of stroller that I needed, he could tell me what I needed and point me in the right direction to find it. Like I said Mike doesn’t make that kind of stroller but as luck would have it he just happened to have one that he had used as a prototype for sheepskin stroller inserts. He had been trying to figure out what to do with this brand new jog-stroller in his warehouse. (Are you kidding me?) Within two hours of our “exception” Mike had donated the stroller and it was on its way to us! And that’s how it happened that THIS Saturday Aaron, Rachel, Leah and Lucy Coleman will ALL be participating in the Salt Lake City Half-Marathon!!! You can jump up and down a bit and even whoop and holler. I wont tell. Or better yet, if you are in town we would love to have you cheer us on. I think we’ll be pretty easy to spot… see, we’ll be the ones with the stroller.